Low crime and a healthy and creative lifestyle help to make Santa Clarita one of the best places to live in California. In a study conducted by Safewise.com, Santa Clarita was ranked 37th out of the top 50 safest cities in California. Criteria was based on many factors, with the minimum requirements for consideration was for the city to have had at least a population of 20,000 as of 2011. California has 296 cities that meet this criteria. 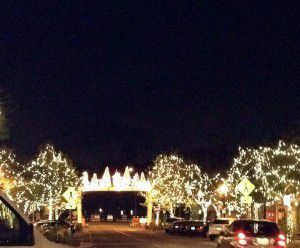 Old Town Newhall sparkles with lights this time of year. The City of Santa Clarita comprises just over 47 square miles with a population (as of 2012) of 179,013. Its diversity in business, housing, and entertainment make it one of the best places to live within commuting distance of metropolitan Los Angeles. Santa Clarita’s relatively low crime rate played a big role in its designation by Safewise. Public safety and law enforcement is contracted to the Los Angeles County Sheriff’s Department, and the Santa Clarita Division promotes regular interaction with community policing, family-friendly events, and Nixle updates that inform the community of their activities and efforts. Another factor included the city’s effort to promote a healthy and creative lifestyle for its residents that includes bike trails, parks, open spaces, hiking trails, and plenty of city-sponsored events that are open to all ages. The renovation of Old Town Newhall has given the city an opportunity to promote its ArtSLAM and Senses on Main events. Montemayor & Associates are licensed, professional real estate agents who are also long time residents of the Santa Clarita Valley. Our work ethic is geared to a win-win philosophy to insure our clients have the best experience when it comes to buying or selling a home. If you would like to know more about the Santa Clarita Valley, and options at your disposal for loan qualification and purchase of a home in our community, feel free to call either of the phone numbers listed at the top of the page, or use the quick response form below. We’re glad to be of assistance!